If you could remember every single day of your life, would you want to? Home 2017 February 2 If you could remember every single day of your life, would you want to? After reading a Vice article about a documentary following a boy who can remember every single day of his life, I was captivated. 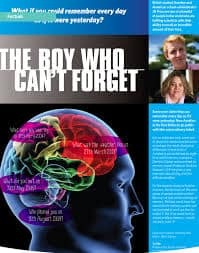 The documentary is called The Boy Who Can’t Forget by Real Stories. It begins by introducing Aurelien, a twenty-two-year-old University student in Britain who can tell you what day of the week every single day of his life was, including what he was doing, who he was with, and how the weather was that day. The first few minutes consist of the film consist of the interviewer asking Aurelien about various days in his past. Later, the film goes on to follow Jill, a middle aged woman who’s memory is even more extensive than Aurelien’s. She has experienced some negative emotional effects of the condition. According to Wikipedia, the condition is called hyperthymesia, and “two defining characteristics of hyperthymesia: spending an excessive amount of time thinking about one’s past, and displaying an extraordinary ability to recall specific events from one’s past.”. There are prominent drawbacks and advantages of this impressive memory: is it more advantageous or more hindering? If you could remember every single day of your life, would you want to? by Siena is licensed under a Creative Commons Attribution-ShareAlike 4.0 International License. Running Out of WaterSave the Bees!